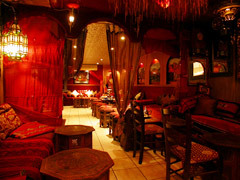 Visit Mamounia Lounge for a spot of delicious Lebanese food in the comfy surrounding of this café restaurant. Located opposite the Queensway underground station, Mamounia combines a café in front of the building with a restaurant at the rear. The theme in this restaurant is the Bazaar, and the restaurant decorated to resemble an Arabian bazaar with an organised jumble of artefacts. The Middle Eastern design, deem lights, low tables and warm colours, creates the perfect environment for a casual dinner or a get-together with friend. Parties can be held in the main restaurant or in the private room in the first floor that can hold parties of up to 20 people. The food here is mainly Lebanese with a small selection of Moroccan delicacies such as Tajin completing the mix. If you like grills or fish, then this is definitely your place. The caf� here is open all day and you can enjoy a pot of sweet green tea or Arabian coffee at any time of the day, to be served with your choice of Lebanese sweet. Weather permitting you can sit outside and watch the world go by. There are entertainments such as belly dancing and live Arabic music on selected evenings and the restaurant can organise entertainment on all other evenings by request. There is a private room for parties of up to 20 people and the restaurant can be sectioned and separated from the Cafe for larger parties. The food is tasty and authentically Lebanese, with the mezze dishes and great Lebanese specialities and grills all on offer. Vegetarians and seafood lovers will not be short of choices neither. There is also a selection of sandwiches and wraps for those who are just looking for a quick bite to eat or take away.